The Zambian Watchdog is currently trying to locate ailing dictator Michael Sata who has not been seeing in public for many weeks now. Rumours are mounting that the Zambian president who last week celebrated his 76th birthday maybe in hospital somewhere. The Watchdog can’t verify with State House right now for fear of being arrested as the police are currently looking for anyone connected to the Watchdog. One senior member of the ruling party (PF) suspects that Sata could have been evacuated on Saturday evening, June 6, 2013. The same source has disclosed that cabinet has not met for three weeks now. Sata was last seen walking many weeks ago during the by-election in Feira. Even then he was just shown standing on a podium addressing voters before he got back into his chopper and flew to State House. Since then, he has missed two very important events. He was supposed to be at the official opening of the International Trade Fair in Ndola but could just not make it. No reason was given. The international Trade fair is traditionally opened by a foreign head of State in the company of the Zambian president as host. This has been happening every year from 1964. It was only this year 2013 that the Trade Fair was downgraded and only opened by a minister of agriculture and livestock. Late last week it was Sata’s birthday. His supporters had expected him to say something or at least spend it with some under privileged people in society since he naturally loves cheap publicity. But nay, he was no where to be seen, even though photos of his wrinkled face were splashed all over the newspapers to wish the ‘leader’ happy birthday. The other time he was heard speaking and showing in pre-recorded videos was when former president of South Africa Thabo Mbeki visited Zambia. Even then he was just shown talking while seated down or standing very close to a chair. Since then, angry and emotional statements from State House has been issued on his behalf. But no one has heard Sata speak for many weeks now. 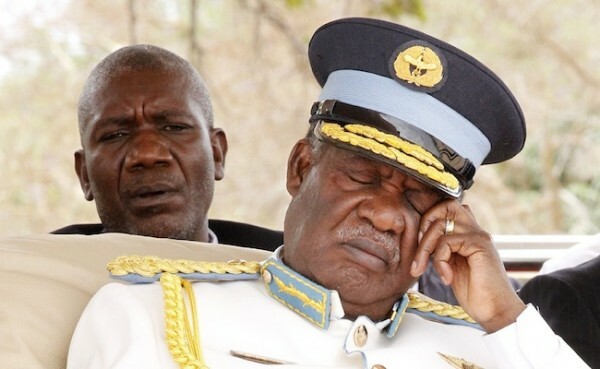 Sata has been having health problems from the time he became president. Not long ago he was in India for medical treatment. See here . But his handlers vehemently denied the ailing dictator was sick. They said he was wooing investors from India.